If you want to lift your truck, there is only one name you need to remember: R.P.M. Performance. Our technicians are ready to install a new lift kit from some of the best brands on the market. Call us today for a free quote or build your dream vehicle here. If you want to have the tallest truck in order to better climb or because you like riding high, give R.P.M. Performance in Burlington a call! We would love to discuss how we can bring your project to life. From the best lift kits to tires and wheels that are perfect for your needs, we have the know-how and the tools to make it happen. If you aren’t sure whether a lift or leveling kit is right for you, learn more about leveling kits here, or contact us. We can discuss what you are using your truck for now, what you would like to be able to use it for, and how we can help you get your truck there. 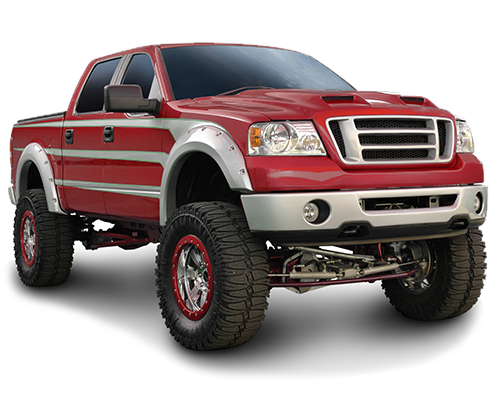 Build out the fully customized truck of your dreams with our Interactive Garage feature. Start with your base vehicle and add on everything you want to make it into a one-of-a-kind beast that perfectly meets your needs. No one else in Burlington is better equipped to make your performance vehicle dreams a reality.